Whether you are an avid gardener or just beginning to get your hands dirty, we are sure you will enjoy selecting from our wide variety of heirloom and unusual flower, vegetable and herb seeds. We pride ourselves in that our seeds are Untreated, Non-GMO, and Non-Hybrid. Most of our seeds have been organically grown, but are not organically certified. We package by measurement and not by seed count. We ensure that every package contains a very generous seed count. You may even find you will have seeds to share. We hope you enjoy browsing through our website. Purchase a gift certificate for the avid gardener on your list. We will NOT be attending the 2019 Peterborough Garden Show due to uncontrollable circumstances. You can send your seed orders via: mail, e-mail, phone, fax or order on-line. We appologize for any inconvience this may cause. We are in the process of adding seed counts on all our varieties. These counts are an estimated approximates. Let us HELP YOU with your Upcoming Events. What makes our seeds so popular with gardeners? Florabunda Seeds is dedicated to preserving old species of flowers and vegetables, many of which are the parents of today's modern hybrids. These are the flowers of English cottage gardens of the past, species such as hollyhocks, cosmos, foxglove, calendula, asters, zinnias, flax and cone flower. 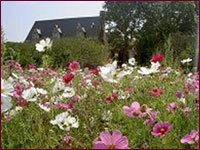 Florabunda Seeds has grown into one of the largest suppliers of Victorian Cottage Flower seeds. Cottage garden seeds were salvaged from abbeys and monasteries in England in the middle ages. Others were brought back to Britain by plantsmen who were sent out on plant-hunting expeditions around the world. Modern planting breeding and hybridization have turned the public's eye away from many of our precious heirloom flowers, including the original species and the old, named heirloom varieties. By preserving and circulating these seeds, we help maintain a strong genetic plant base, thus ensuring their survival. 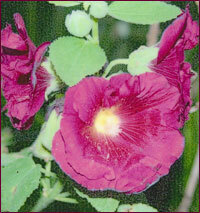 Our flower and vegetable seeds have a long and colourful history. In planting Florabunda seeds, you play a part in not only continuing the history of heirloom seeds, but of adding to the history with your own gardening stories. Safe Seed Pledge: We pledge that we do not knowingly buy or sell genetically engineered seeds or plants. Our Guarantee: All seed is untreated. Our seeds are fresh and you should expect a bountiful yield, given the proper growing conditions. If, for any reason, you are not happy with our product, we will be glad to replace the item, substitute for another variety or refund the purchase price. Our Packaging: The seed quantity in each package is generous. Sowing instructions and hints are found on the back of or inside the package. We package varieties with small seeds in glassine envelopes that are placed inside the larger paper seed envelope. Although we are based in Ontario, our seeds go to many countries and so we have chosen varieties which will thrive in a wide diversity of climates. Learn more about climate zones. Request your free copy by phone, fax, mail or email. 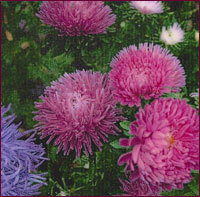 Annuals are plants which complete their life cycle, flowering and going to seed in their first year. They have the longest bloom season. Biennials grow strong plants in their first season which bloom in their second season and self-seed, then die providing their own replacements for the next year. They are self perpetuating. Perennials' leaves die back in winter and renew growth each spring. Some bloom first year from seed and others start in their second year. They often live for decades. Bloom time is generally shorter. a seed that once sown never dies"
been Joyful and free from blame." IS A SPECIAL EVENT IN YOUR FUTURE? Florabunda Seeds can supply you with seed packets and custom labels to use as favours. This Thoughtful gift will bloom yearly and your guests will have an annual reminder of the special event. Please call or email us to discuss your event and we'll be happy to advise you on appropriate seeds, custom packaging and costs. We now offer Seed Favours For Special Events - learn more here. If you're rallying the troops in a fund raising drive then put Florabunda Seeds on your team. Seeds have proven to be a popular sales item in fund-raising drives for such organizations as: choirs, schools, churches, horticultural societies, scouting groups, clubs and associations. Because of their low price point, environmentally friendly nature, low shipping costs and ease of storage they invariably prove to be overwhelming favourites of fund-raisers everywhere. Please call or email us to discuss your fundraiser and we'll be happy to advise you on appropriate seeds, custom packaging and costs. Learn more about FundRaisers here.